Multimaging platform and software is now able to study distribution of elements with Laser Ablation Inductively Coupled Plasma Mass Spectrometry (LA-ICP MS) instrumentation. LA-ICP-MS Imaging (Laser Ablation Inductively Coupled Plasma Mass Spectrome- try) is a recent technology that enables sensi- tive elemental and isotopic analysis to be performed directly on biological tissue samples. It has been used to study the distribu- tion of gadolinium, calcium, potassium, lithium, iron, copper, zinc, gold, aluminum, platinum, etc. LA-ICP-MS begins with a laser beam focused on the sample surface to generate fine particles – a process known as Laser Ablation. The ablated particles are then transported to the secondary excitation source of the ICP-MS instrument for digestion and ionization of the sampled mass. The excited ions in the plasma torch are subse- quently introduced to a mass spectrometer detector for both elemental and isotopic analysis. LA-ICP-MS can perform highly sensitive and quantitative tissue analysis without any sample preparation (picograms to femtograms). The spatial resolution is generally between 1-350µm depending sensitivity. Calcium is an important endogenous element that serves in every cell and many functions of the organs (muscle, brain, blood, etc.). In skin, calcium has been described to regulate several key physiologic events including epidermal proliferation, diuerentiation and cell—cell adhesion. Disruption of Calcium regulatory pathways can lead to calcification and ossifica- tion of the skin. Here we present a first example of Calcium detection and localization on a skin sample with diuerent concentration from the epidermis and dermis. 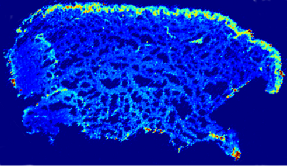 The 20µm spatial resolu- tion showing 225 000 pixels in the image with a higher concentration in the epidermis com- pared to the stratum corneum and the dermis. The concentration has been evaluated at 20-40µg/g and 8µg/g of tissue for the epidermis and the dermis respectively. Gadolinium complex are the most reliable MRI (Magnetic Resonance Imaging) contract agents on the market. These contrast agents in combination of MRI instruments help to visualize organs, anatomy and physiology. In this second example, we can study the Gadolinium distribution within the brain tissue, after Intra venous mouse dosing. Animal has been prepared through Fast Frozen process to keep intact morphology and analysed with LS-ICP-MS imaging process. In this study, the gadolinium has been detected in all the brain tissue with diuerent concentrations (bregma 11.28mm). The higher concentration of Gadoli- nium complex is localized in diuerent ventricles (especially the 4th ventricle). Interestingly, 4 diue- rent regions present the gadolinium (Sup cerebel- lar peduncles, Granule cochlear, Interposed ante- rior, Lateral cerebellar parvicell and lateral cerebel- lar nuclei). Moreover, gadolinium complex seems to follow the white and grey matter histology. Regarding concentration, Gadolinium has been detected from 50ng/g to 500ng/g of tissue. LA-ICP-MS imaging is really interesting to investigate elemental analysis. This is a com- plementary technique that has been added to ImaBiotech’s platform of Multimaging. With Multimaging software, it is also possible to overlay ICP images with other MALDI, DESI, LESA Mass Spectrometry Imaging and immu- nohistochemistry images at cellular level. This makes a reliable set of tools and software to support your investigation.